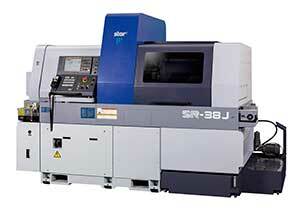 Star Micronics Co., Ltd. will launch SR-38J, a new model of Swiss-type automatic lathe focused on the machining of large diameter workpieces for manufacturing industries including automotive, hydraulic and pneumatic devices worldwide in November 2018. Complementing the SR-38 series of lathes launched in 2016 which can machine up to 38 mm of diameter, the new model has selected functionalities for multi-processing with 5 linear-controlled axes. The portal-type tool post is arranged to surround the guide bush for the front-side machining. In addition to the standard 5-tool holder, the optional 3-tool holder can be mounted on the operator side, which, together with the 2-tool holder on the rear, makes the total of 10 outer diameter machining tools mountable. Regarding multi-processing, 3 power driven axes are mounted on the tool post for cross milling with an extra cartridge position to mount the tooling unit to meet your needs. By mounting the optional extension unit at the cartridge position, the number of tool units can be increased to allow a variety of tooling configurations. Together with the back-working tool post mounted with the 4-spindle unit, front and back sides of the workpiece can be machined separately or simultaneously to reduce the total machining time. Further, this model employs the guide bush switching mechanism to meet a variety of machining needs. The guide bush mode is useful in machining long workpieces such as motor shafts as the guide bush works as a material steady rest for high accuracy machining by reducing runout of the workpiece. On the other hand, machining of short parts such as nuts can be optimized by adopting the non-guide bush mode, as it will lessen the length of stock waste, reducing the material cost. Additionally, the NC system is installed with a variety of help features such as an alarm help function for checking alarm contents on NC screen. With the swing type control panel to facilitate operation at the optimum position, or the flip-up door to ensure wide opening and sufficient workspace for setups and maintenance, this model is designed for improved operability and workability for the operator. The portal-type tool post gives high extensibility of mountable tools for front-side machining to facilitate flexible tooling. A tool unit for such machining as cross-milling or front-drilling is mountable at the power tool cartridge position. An optional cartridge position extension unit allows up to two more cartridge positions to be added for even more advanced tooling configuration such as slitting or thread whirling. A rotary cylinder ensures stable gripping force for main spindle collet opening and closing. A mechanism to switch between guide bush and non-guide bush modes is adopted for machining optimization for various length of workpieces. Non-guide bush mode utilizes the spindle head slide guideway structure to ensure the rigidity of the main spindle. A swing type control panel facilitates operation at the optimum position all the time. The headstock chamber and cutting chamber use flip-up doors to provide sufficient work space.